Preheat oven to 350F. Spray a 9×5-inch loaf pan with floured cooking spray, or grease and flour the pan; set aside. Loaf – To a large bowl, add the eggs, sugar, sour cream, and whisk vigorously until smooth and combined. Add the lemon zest, lemon extract, and whisk to combine. 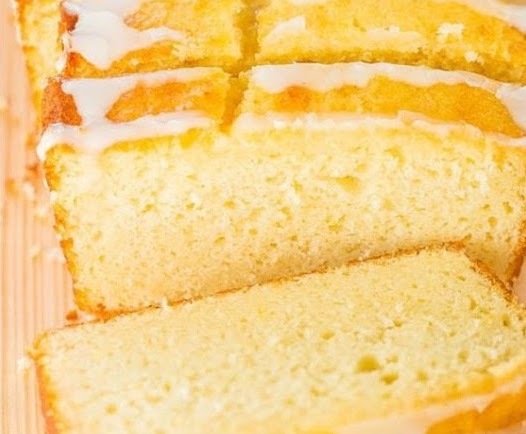 Note – I used 2 tablespoons of lemon extract because no actual lemon juice is used in the loaf and I found 2 tablespoons lemon extract necessary for full-bodied lemon flavor, but add to taste. Don’t use lemon oil and lemon extract interchangeably because they’re not; oil is much more potent and intense. Don’t use lemon juice in place of lemon extract because it’s not strong enough and the acidity can alter the overall results. Add the flour, baking powder, salt, and stir until just combined, don’t overmix. Some lumps will be present and that’s okay, don’t try to stir them smooth. Turn the batter out into prepared pan, smoothing the top lightly with a spatula. Bake for about 50 to 52 minutes, or until top is domed, set, and toothpick inserted in the center crack comes out clean or with a few moist crumbs but no batter. In the last 10 minutes of baking, tent pan with foil (loosely drape a sheet of foil over pan) to prevent excessive browning on the top and sides of bread before center cooks through. Allow loaf to cool in pan on top of a wire rack for at least 30 minutes (I cooled 4 hours) before turning out onto rack to cool completely before glazing. Lemon Glaze – To a small bowl, add the confectioner’s sugar and slowly drizzle in the lemon juice while whisking until smooth and combined. You may need to play with the sugar and lemon juice amounts a bit as necessary for desired consistency and flavor. Evenly drizzle glaze over bread before slicing and serving. Extra glaze can be spread on the cut surface of the bread like you’d spread butter on toast and it soaks right in making the bread even moister and more lemony. Or you can halve the glaze recipe if you’re not a glaze person. Bread will keep airtight at room temperature for up to 5 days or in the freezer for up to 6 months; I don’t recommend storing it in the fridge because it’ll dry out.